A couple of years ago New York art historian Shelley Rice predicted that spirit photography was going to be big. Speaking at the Art Gallery of NSW’s World Without End exhibition (2001), Rice seems to have forecast a Zeitgeist (fittingly ‘time ghost’) manifest in recent Sydney photography shows that evoke the phantasmagoric, the spectral and the uncanny. At the Gitte Weise Gallery, 19th century spirit photographs with their white plumes of ectoplasm are directly referenced in Cherine Fahd’s A Woman Runs. The first of Fahd’s 9 large black and white photographs is a composite image of 3 women. One superimposed, cloth-draped figure dominates the frame, hovering like an oversized genie. Through her smoky shape we see a woman in a landscape of dark trees, running across the pine-needled forest floor. Another translucent figure appears to lie limp in the arms of the genie, legs askew, head out of frame, neck bent awkwardly back. In appearing to haunt the running woman, these pellucid forms suggest we cannot escape—running or standing still—the constant spectre of our inevitable death. Because it hangs near the gallery entrance this work, A Woman Runs into the Invisible, has a prologue effect—its deathliness, its invocation of an intangible plane (also suggested by its title) ghosted me as I viewed the series. All works feature women, singly or in pairs, running from a stand of pines. In all except one shot, the women are photographed face-on, they are often barefoot, occasionally bare-chested, partially clothed in shawls or skirts of grass and underwear as if in preparation for some woodland ritual. The composition prompts the question: who or what are the women running toward? Because they wear expressions of serious intent or abandon rather than fear, they do not appear to be escaping or fleeing but we sense they will inevitably arrive. With arms outstretched, some seem about to alight in robust flight. 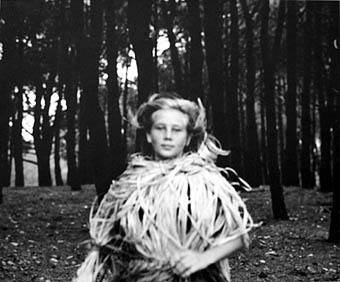 Fahd’s work is strongest when its slightly naive and overtly celebratory qualities are implied: in the final work the face and torso of young Alicia are centre frame and though we cannot see the body running, the suggestion of movement—her blurred features emanating light, the grass tossed around her neck—is enigmatic. Alicia’s adolescent face has an inchoate quality, her expression of tender expectation beguiles because it’s ambiguous. This last image completes a kind of magic circle, in which we move backward from the spectre of death, through exuberant feminine energy to blithesome youth. In all works the introduced landscape (pines, not native bush), the women’s dress and behaviour suggest an evanescent realm outside real time and place: an otherworld. Also haunting and otherworldly but far less ethereally so, is Polixeni Papapetrou’s bold series Phantomwise at Stills Gallery. On first glance these one metre square, unframed prints, tacked poster-style on the walls, seem to depict lifeless dolls, in quaintly cliched scenarios. These character ‘types’: The Last Pharoah, Gatsby Girl, Pilgrim Quilting, Turkish Pasha, Gypsy Queen were inspired by a set of Victorian masks that Papapetrou purchased before the birth of her daughter, Olympia. Why do we search these deathly pictures for signs of life? Perhaps because as Papapetrou’s title suggests, the frozen charades in each photo seem less like child’s play than a phantasmagoria, less like performance than stasis: a series of lifeless caricatures. Of course, that’s the thing about archetypes—as generalities they are inevitably bland. But we might expect, given a child’s involvement, an element of ‘play’ here: it’s dressups after all. And if play is a metaphoric state that enables the child to move from one experience to another via the imagination, we get the feeling this is Polixeni’s game and her imagining. Each scene is painstakingly composed, with a touching and uncanny fidelity to detail. In Pilgrim Quilting, the dour subject, stiff-backed in her chair, sews by candlelight; books piled by her side include, of course, The Bible. The Gypsy Queen sits at a table with 6 Tarot cards, a crystal ball and a delicate teacup for spooking up mystic wisdom; the Turkish Pasha poses—naturally—on a flokati rug. If this is child’s play then it’s a peculiar hybrid of hide-and-seek and statues. There’s no active abandonment in this inert masquerade. In most photos Olympia reclines—demurely on the chaise lounge as Gatsby Girl, primly in smocked dress and milkmaid plaits beside a chipped enamel bucket of tulips as Dutch Girl. But where she is posed more dynamically we have a greater sense that she is truly present—the wonderfully moody Jack Tar shows sailor-suited Olympia spoiling for a brawl, hands on hips, a length of rope slung over her shoulder. In Indian Brave she sppears even more alive (see cover image). Standing close to the frame, cut off below the torso, in feathered headdress, she poses bare-chested without props against the velvety black background. By exposing Olympia’s skin, in the light and shadow that highlight the grooved architecture of her ribcage, the unique knot of her navel, Papapetrou literally gives us more of her. And Olympia’s defiant, macho stance is poignantly contradicted by the youthful doughiness of her arms, the lovely formlessness of her muscles and the fact that we know he’s a she. Just as Cindy Sherman’s work suggests the scripted predictability of feminine cliches in contemporary culture, Papapetrou’s images play with cultural and national archetypes, age and gender. By miniaturising adult personas in the body of a child there is an uncanny dislocation between what’s real and what’s being enacted. And in suddenly accelerating Olympia’s physical age through the simple act of masking, these pictures also carry an eerie premonition of death. While 19th century spectres seem composed of light and air, Papapetrou’s phantoms are entirely solid. Their spectral effect comes from the literal effacement of the human subject: Olympia’s neat mouth, slightly open in Court Beauty, reveals nothing more of her self but blackness.